Chris was walking down a Bangkok street one day when he saw an owl in a cage dangling from a string on it’s foot in a cage. The owl’s foot was swollen and it was obviously not doing well. He stood there staring at the bird, wondering how anyone could treat it this way. An overwhelming sympathy and sadness welled up in Chris for the bird, and he decided to do something. On the spot, he bought the owl and brought it home. Based on the bird’s color, Chris and his wife Jojo, named their new owl ‘Nutmeg.’ They knew they wanted to help the bird, but didn’t know how. Lucky for them they had a friend who happened to be an ornithologist. Not only that, but he specialized in rescuing endangered birds from the illegal pet trade in Bangkok. Their friend recommended they seek out help at the Kasetsart University Veterinary Hospital, where a resident raptor expert resides. The found out that they had a Scops Owl and that the birds beak and wing were broken. The hospital was able reshape the beak, set the wing, and give Chris and Jojo instructions on how to care for Nutmeg. After four months Nutmeg was eating on it’s own, flying normally, and ready to go back to the wild. In the case of the Scops Owls they actually do very well in cities, where artificial lighting attracts the myriad of insects that they eat. So Chris and Jojo released Nutmeg into the streets of Bangkok and hoped for the best. Since that first bird about 3 years ago, Chris and his wife Jojo, have rescued over 50 birds from poor conditions in the animal trade in Bangkok. At the moment, they have 2 birds at their home. Sherlock is a Barn Owl and Shakespeare is a Barred Eagle Owl. I visited them at their Bangkok home on a hot humid morning just in time for feeding. Breakfast was chopped up chicken parts which were fed by hand to Shakespeare. He or she, they don’t know which, liked to play tug of war with the bits of chicken, and it seemed to be an effective way to help him eat. “Shakespeare can’t fly too well,” says Jojo. They have had him for just about 2 years, since he was a baby chick, but he has been one of the most difficult of all their birds to get ready for release. They fear Shakespeare won’t ever be able to go back to his true home in the wild. Critically endangered Yellow Crested Cockatoo on display at Chatuchak Market. Bangkok, Thailand. Some of the birds that Chris and Jojo have rescued have been from Chatuchak market, an enormous and bustling market in Bangkok that sells a bit of everything, including animals of all types, from hedgehogs to turtles, cats, dogs, monkeys, and birds of all types. I visited Chatuchak twice during my trip to Thailand and each time was overwhelmed at the quantity of animals for sale. Some are in good and healthy condition, and some are not. However, conditions are much better now than they have been, and it’s harder to find endangered or illegal animals for sale. But you can still find them. Even as a caucasian tourist walking around with a large camera I was able to take pictures of endangered species for sale such as the Grey parrot (Psittacus erithacus) , Asian Arowana (Scleropages formosus), and the Yellow Crested Cockatoo (Cacatua sulphurea), which is critically endangered. Though these animals are endangered and listed on Appendix I of CITES (the convention on international trade in endangered species) which prohibits the sale of these animals unless for scientific study, they are still allowed to be sold if they are born in captivity. This creates an easy loophole as it’s nearly impossible to tell if an animal was raised in captivity or captured from the wild. Asian Arowana in an aquarium at Chatuchak Market in Bangkok. 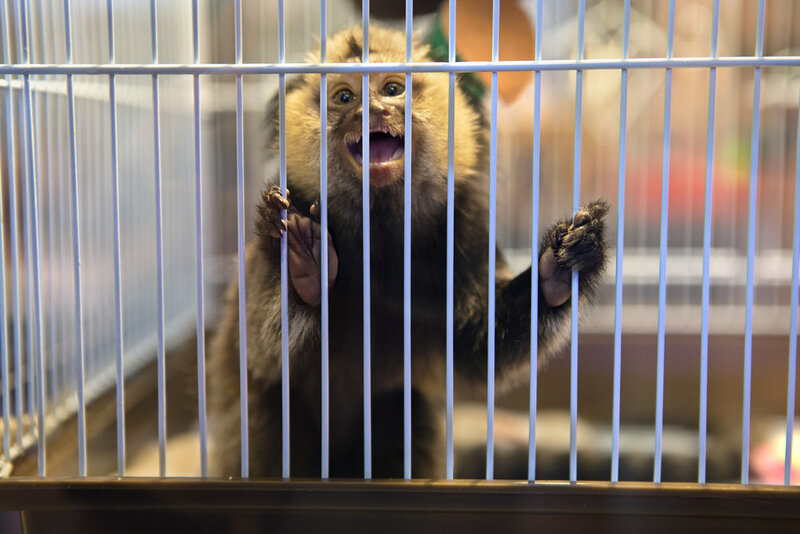 Pet traders will often pass off captured wild animals as captive bred because many species are very difficult to raise in captivity, and it’s cheaper to illegally capture them in the wild. It also leads to animals being captured from the wild to start animal farms. When they fail to breed or demand outweighs supply it leads to more capturing, thus creating a vicious cycle. These are Indian Star Tortoises in a cage at Bangkok’s Chatuchak Market. Listed as ‘vulnerable’ by the International Union for Conservation of Nature (IUCN) this tortoise is one of the most common found at Chatuchak. The vulnerable listing means that the species is in a dangerous decline, likely to become endangered if pressures are not relieved. In this case it is largely the pet trade that is driving it’s decline. As certain desirable pets become endangered or near extinction, others are found to take their place. This has been the case with the Radiated Tortoise, an endangered species endemic to Madagascar. Several years ago, this was the tortoise of choice for exotic pet owners. It quickly became near extinction as it has an intrinsically small population to begin with. The Indian Star Tortoise seems to have taken it’s place and has since seen rapid declines. It’s only a matter of time before it suffers the same fate unless large public education efforts and protection measures can be put into place. 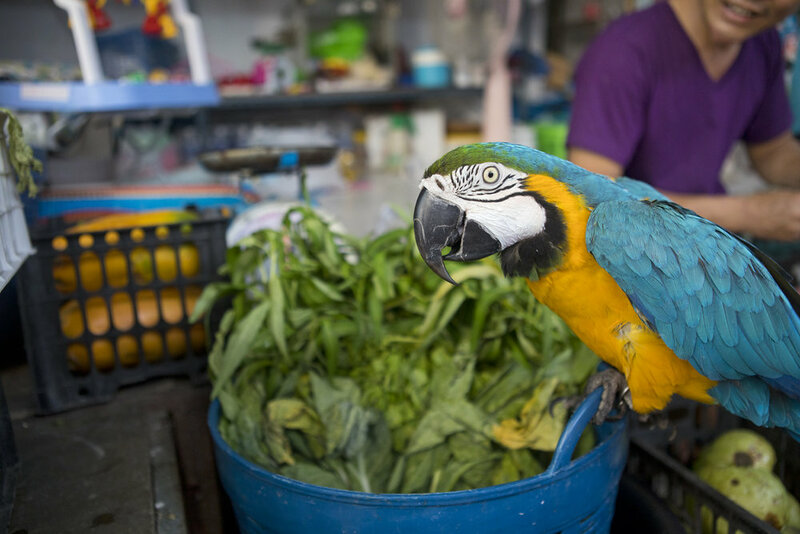 This pet vendor didn’t mind me taking photos of his blue and yellow Macaw, but when I ventured inside the store and started snapping photos of a pair of Grey Parrots, I was quickly ushered away. Macaws are a species of ‘least concern’ according to the International Union for Conservation of Nature (IUCN), while Grey Parrots are endangered. A pair of Grey Parrots (Psittacus erithacus). It is one of the most popular avian pets in Europe, the United States, and the Middle East due to its longevity and unparalleled ability to mimic human speech and other sounds. Signs like this are hung thought the market urging tourists not to buy ivory or endangered animals. These signs are relatively recent, and are due in part by efforts of a NGO group known as Freeland. It is Freeland’s goal to protect vulnerable wildlife and people from organized crime and corruption. Headquartered in Bangkok, I met with their Communications Director, Matthew Pritchett. I asked him of the progress that has been made in stopping the illegal animal trade and what hurdles still remain. He was both optimistic and realistic, relating the good progress that has been made in recent years and acknowledging the shortfalls and gaps that still remain. Freeland Communications Director, Matthew Pritchett. “A positive sign among governments is that many nations have recently been destroying their ivory stockpiles. For years, seized ivory was held in warehouses, and sometimes that ivory would mysteriously go missing. The last stockpile that Kenya destroyed was over 100 tons.” While China has historically been one of the greatest consumers of wildlife in the world, they took a step forward when on the first of January this year, a ban on the sale of ivory went into effect. The ban was announced in 2017 along with an enormous public awareness campaign, with celebrities such as basketball player Yao Ming taking a stand. Over the last several years Freeland has been working with local police on a major undercover operation to stop one of the largest wildlife smuggling rings in the world. Nicknamed ‘Hydra’ for it’s multi-headed operation. It includes Vixay Keosavang at the head of the operation and his two major suppliers, the brothers Boonchai Bach and Bach Van Limh. Based out of the sleepy Thailand border town of Nakohn Phanom, the Bach brothers have been operating an illegal trans-continental trade in animals for over a decade. They have transported untold tons of animals from Africa through Thailand, Laos, Vietnam, and China. In January of this year, due to years of undercover operations and intelligence gathering from the Freeland organization and with co-operation of local police, one of the brothers, Boonchai Bach was finally apprehended. Boonchai was arrested after undercover agents followed a shipment of 14 rhino horns through security at Bangkok’s Suvarbanhi International airport. A routine check of cargo on a flight from Ethiopia revealed the horns and this led to the arrest of a Chinese courier, two more of Bach’s operatives, and then Bach himself. Previously considered ‘untouchable,’ Freeland considers this a huge victory for wildlife. At my second visit to the infamous Chatuchak market in Bangkok I was making my way to the district where the animals are sold and I came across an interesting but chilling statue. It was in an artist’s nook with predominantly sculptures and paintings. I didn’t know what it meant, but it caught my eye and I started photographing it. After several minutes one of the artists who had a storefront in the area came up to me and asked me if I knew the meaning behind the statue. I professed my ignorance, and she began to tell me it’s meaning. The statue depicted a cat, a black variety of the Indochinese Leooard, or black panther to be more specific, but it was in the form of a human bust, (a replica of Davinci’s David) no less. Around its neck was a sash that read #black panther killed in Thailand. There was a blood red tear coming from it’s eye. The David statue had been repurposed, painted over black with some cat features added in. The shopkeeper explained to me that just a few days ago, the president of Italian Thai Development (ITD), had been caught with the remains of a rare black Indochinese leopard, and other endangered species in the Thungyai Naresuan wildlife sanctuary in Thailand. He and 3 others were arrested on charges relating to poaching, animal cruelty, and weapons possession. When the news of this came out, there was a huge public outcry among Thai citizens, with demonstrators holding protests in Bangkok, and Bangkok newspapers calling for Premchai to step down from his role as President of ITD. Protestors at the Bangkok Arts and Culture Center and students at Chulalongkorn University donned black panther masks and staged re-enactments of the killing. Karnasuta was released on bail a few days after the charges. It remains to be seen if he will be convicted, and if so, if he will do any jail time or be allowed to pay his way out. After the poaching incident, it has come out that Karnasuta’s company, ITD, has plans to build a 93 mile road through some pristine wilderness areas starting at the Thai border, and ending in a planned special economic zone in Myanmar. The road would cut through an area that is home to many endangered and threatened species, such as tigers, elephants, and leopards. Lee Poston, of WWF, said: “The road…will be disastrous for many of the rare, endemic species in this wilderness. In the preliminary hearing in March, Karnasuta denied all charges. The full trial is currently set for November 2018. Marmoset species in Chatuchak Market. In addition to the several obviously endangered species I came across and was able to photograph, there were countless others that are listed as vulnerable or nearly threatened. I can only guess about the species that were behind closed doors or kept in trucks out back, waiting for someone to come along and make a shady deal. Regardless of the species status though, I personally find it morally reprehensible to capture wild animals and keep them as pets. Most animals will never be domesticated and cannot be compared to owning a cat or dog. There were tens of thousands of these animals in just one market in Bangkok. After talking with Matthew Pritchett of Freeland organization I was happy to hear that progress has been made, however it’s clear that we still have a long ways to go. A squirrel chained in a cage in Chatuchak Market. Squirrels are a very popular pet in Thailand. These Green Turaco (Tauraco persa), behind bars in Chatuchak Market are not currently threatened. However, you never know which species will be the next ‘hit’ after the currently popular pet species are wiped out to near extinction. Two Alexandrine Parakeets (Psittacula eupatria) seen here at Chatuchak market. This species is listed as ‘near threatened’ on the IUCN red list. The reason it has become threatened is that it is widely captured and traded as a cage-bird. Despite the near-disappearance of the species from Thailand, nestlings still appear in illegal trade in Bangkok bird markets, although they possibly originate from Cambodia. A Praire dog is dressed up in a denim suit in one pet shop inside Chatuchak market. There are five species of Prairie dog and are all indigenous to North America. The animal trade, wether for pets, traditional medicine, or status symbols is a sad business. The earth is currently experiencing the fastest rate of species extinction ever. The global animal trade plays a major part in that. Human health is endangered by the unregulated trade of wild animals that can spread diseases, such as SARS and avian influenza. Organized crime feeds of the blood money from the illegal wildlife trade, as the profits are channeled into other illegal enterprises like narcotics and the flesh trade. Consider donating to the Freeland Organization to help fight animal and human trafficking. Bear Ears National Monument Under Attack! I can't remember when I first heard about Indian Creek, but I know that it had entered legendary status in my psyche long before I first showed up there in May of 2009. I had barely learned how to hand jam, the technique that makes crack climbing go from being nearly impossible to not much harder than climbing a flight of stairs (if your hand fits in it just right). Most of the area in this photograph would lose Monument status under the new reduction. On the right (the climbing area "Cliffs of Insanity" and on the left, the remote "The Wall" Crag) This area would be opened up for oil and gas leasing. For climbers worldwide it has become known as the destination to go to for crack climbers. But there is so much more to it than just a crack climbing area. It is the ancestral and cultural homelands to American Indians, it is ranch land, it is the gateway to Canyonlands National Park. It is a place of solitude and freedom, free of many permanent structures, little pavement, or noisy machinery... At least for now. A cliffside ruins that would be removed from Monument status with the new ruling. But for some, this land is just another quick dollar, a drop of oil in the tank, a momentary boost to the economy in the form of drilling, energy, and mineral extraction. And if President Trump has his way, the spirit of this place will be forever altered. Oil and gas leasing will be allowed to but up right next to current climbing areas and cultural sites. 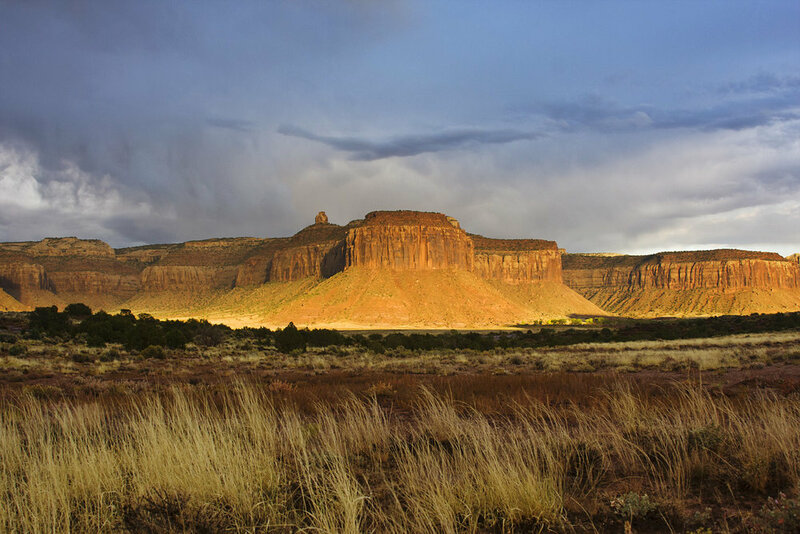 Part of Indian Creek is encompassed in the Bear's Ears National Monument, which was created through the Antiquities Act by President Barack Obama on December 28, 2016. Leading up to Bears Ears designation as a National Monument climbers and tribes worked together for the common goal of protecting these important lands. Now, these lands are vulnerable to looting, grave robbing, fossil fuel development, and uranium mining. The reservoir with South and North Sixshooter Peaks on the left. A ruins in an area that would lose Monument status near Indian Creek. A room inside a ruins that would lose it's Monument status under Trumps ruling. Scarcely one year after the designation of Bears Ears, and for the first time in history, a President, has decreased the size of a National Monument. 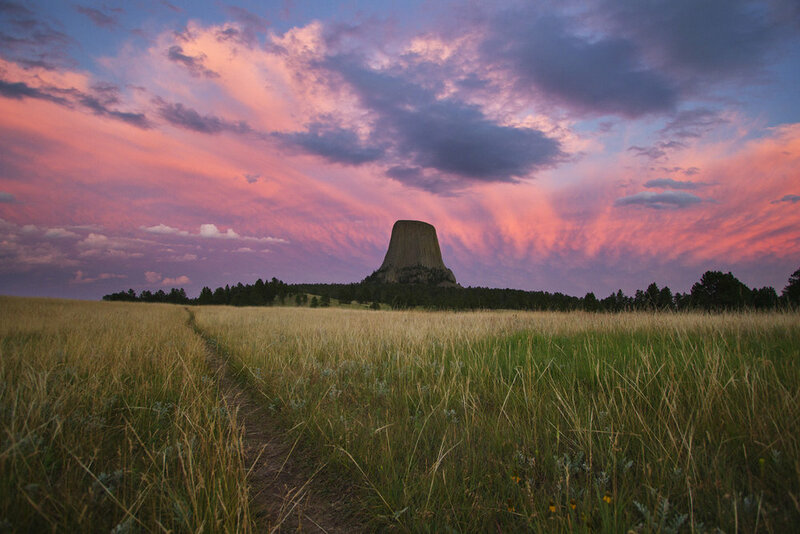 It has been decreased, although nearly 3 million Americans spoke up in favor of keeping the monument as is during a public comment period about proposed reductions. Do our voices not matter? Sunset in Indian Creek country. Rosa Tran climbing the iconic and much photographed route 'Scarface' in Indian Creek. There is no precedent for reducing or removing National Monuments. And many believe that it should take an act of Congress to do so. Several organizations are preparing to sue the President for his illegal actions, including climber advocacy group The Access Fund, Patagonia, The Hopi, Zuni, Ute, Mountain Ute, and The Navajo Nation. This self portrait is from my first visit in Indian Creek in 2009. A long exposure photograph where I only stood in front of the camera for part of the exposure. Just as I appear to disappear, so does Bears Ears National Monument. President Trump's proclamation #9681 has reduced Bears Ears National Monument by 85% and will also reduce Grand Staircase-Escalante National Monument by about 50%. If this proclamation is allowed to stand it will set a dangerous precedent for public lands all over the United States. 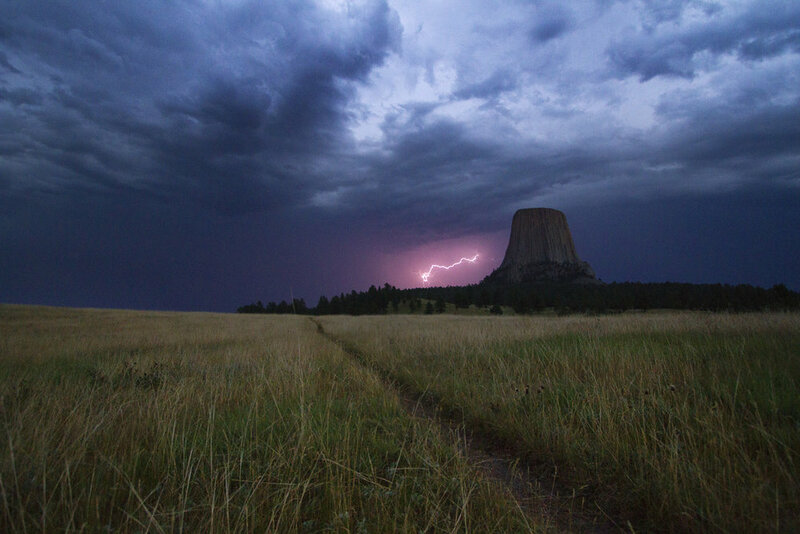 Mato Tipila, or Devils Tower National Monument, was my home for the last two summers. As a Climbing Ranger for the National Park Service, it was a dream job. As a photographer, the Tower is an iconic image. Mato Tipila has many moods, from a grey looming hulk, to a glowing golden giant. There is a place known as the Joyner Ridge that provides some of the best views of the Tower. 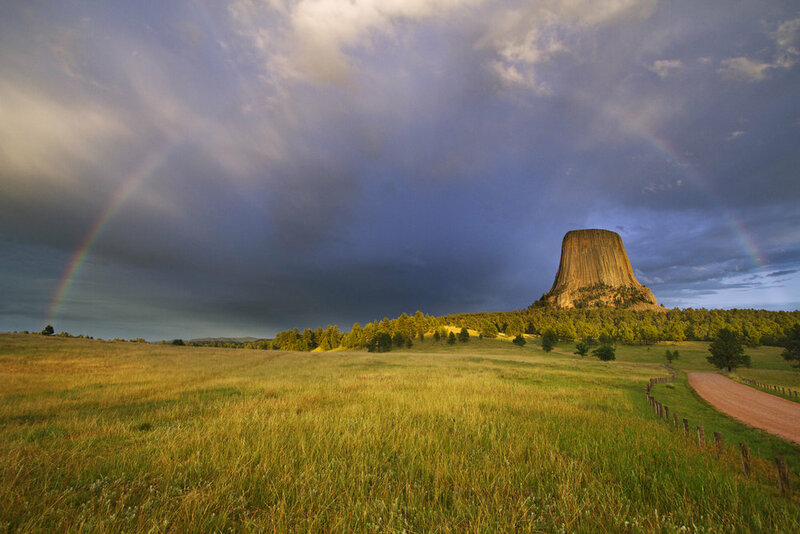 I would often race up there when a rainbow appeared or during a lightning storm, full moon, or new moon. I hope you enjoy these images from those two summers.